Your muscles are tensed, your heart rate is elevated, and you can practically feel the stress pulsing through your veins. You find yourself yelling – cheers, jeers, and frustrated yelps emit from your mouth. Heck, you’re even a little sweaty. You’re breathless, watching the clock, hoping for a victorious finish before the time runs out. Closing out the last loop of a 5K? Nope. Playing the last 30 minutes of a close basketball game? Not even close. You happen to be in your living room, in front of an array of choice snacks and beverages, in your armchair. Welcome to “Big Game” Sunday. 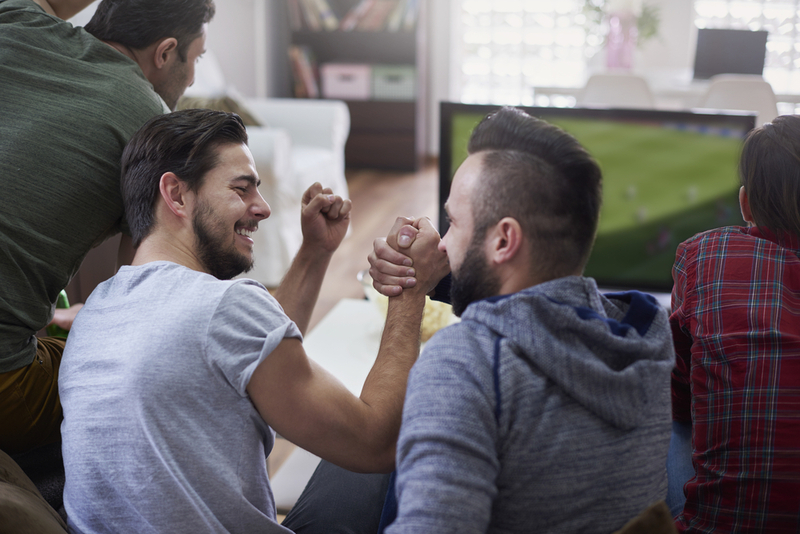 Football can be an intense sport – both to play and to watch. As a devoted fan, multiply that stress by about a hundred if the football game happens to be THE BIGGIE, and one of the teams playing is YOUR TEAM. It’s true that the excitement and breathtaking moments are part of what makes watching football, and other sports, so great to watch. You just can’t beat a down-to-the-second nail biter. However, your body can’t actually differentiate between the different stresses we experience. Whether its stress that are “fun”, or the stress you experience at work, while in conflict, or when in danger, it’s all the same to your internal systems. No matter the situation, your body’s response to stress is the same - your heartrate quickens, your blood pressure rises, your muscles tighten, and you can even experience an upset stomach. Stress also raises cortisol levels, which, if left unchecked, can wreak havoc in various systems in your body. One great way to combat the unsavory effects of stress of all kinds, football game-induced or otherwise, is to book an appointment with your massage therapist, pronto. A 2008 Newsweek article pointed to massage as an effective blood pressure reducer, as it stimulates the vagus nerve, which is known to help lower and maintain blood pressure. Also, multiple studies have concluded that massage is an effective means to lower cortisol, reduce the mental effects of stress and tension, and can even strengthen your immune system (Oh yeah – you’re also more likely to get sick when stressed). Also, you know your spot – the one that gets all knotty and tight when you’re stressed? Those tight little kinks and knots can cause the surrounding muscles to pitch in, leading to an entire area of strained muscles. Be sure to let your massage therapist know of any extra-tight spots, and he or she can pay special attention to those areas. Added bonus: massage can raise the level of dopamine and serotonin, your body’s natural “feel good” producer, which can come in handy in the event (unlikely as it is) that your favored team doesn’t win this Sunday. Treat yourself right after the four-hour Big Game marathon, and your body will feel better, your emotions will stay in check, and you’ll feel your stress begin to decrease within minutes of the beginning of your massage. You deserve it. After all – your body worked hard during the game.